I love this brand had it before looking for a.new one.cause the oyher one broke. Ive been in the market for a toaster oven and purchased this one on sale and i love it it's not to big or to small. It gets the job done and does not take up to much space great purchase. I live in an apartment without much counter space, so I thought twice as to whether or not I needed a toaster oven at all. I finally decided I did, and went for this Black and Decker model because it was very reasonably priced and seemed as if it would serve multiple purposes. I'm very happy I bought it as I've hardly used my oven since I bought it. Since there are only two of us, I rarely need a bigger space. I use this for pretty much all my oven needs - I make small meat loafs, cook chicken pieces, heat up leftovers and of course make toast!!! As far as the toast goes, I find it pretty easy to control the "doneness" using the knobs that control it. The controls I use most often are for the baking - I find it easy to set the time and temperature which makes it easy for me to "set and forget". It's easy to add time if I need to, but it's also easy to know I won't overcook things because I use the timer. All in all, I'm very happy with this product. My sister in law gave us this little toaster oven for Christmas. Since getting this unit I have used it in some way almost everyday. It works well without heating the whole kitchen and house. My son likes it for toaster pastries and such. I have all but forgotten my microwave since receiving this oven. I prefer to heat snacks and such in the toaster oven instead of the microwave. I notice a lot of things come out very soggy and wet more times than not. I have found that the temperature settings work well for normal baking as well as toasting as long as the item your cooking fits in the oven. I would highly recommend this toaster oven to anyone that was sick of microwaved foods or needed to cook and bake smaller dishes. Even Heating For such a small oven this unit heats and cooks very evenly, I was very happy with it's baking ability. Ease of Cleaning The oven is fairly easy to clean there is a crumb try in the bottem, to facilitate removel of any fallen food debris. Design The design of the unit is my only real complaint it gets fairly hot on top and could be a danger to children or maybe some seniors. I give this toaster oven a 10. When I think of Black&Decker I usually think of tools, but they really make some amazing gadgets to use around the house. I remember boring, old regular toasters. You could only make two slices of toast at once, and many times the bread would get stuck when coming out. This toaster oven is so versatile. You can make 4 pieces of toast at once, and there is a knob for changing the settings, so you can have it really toasted or just light brown. This is so much more than a toaster though. I routinely cook meals in this machine. I make thin sliced chicken breast, cinnamon toast, French fries, any types of frozen foods, and mainly to re-heat leftover pizza. I love how the outside is stainless steel so it looks modern and is easy to clean. The nicest feature of this in my opinion is the pull-out crumb tray. You can clean it any time, just pull it out, dump the crumbs, wipe it down and replace. I love this, so easy to clean! 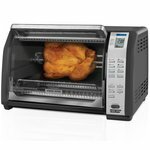 Great toaster oven and reasonably priced. I used this toaster while awaiting my new stove to arrive. Every day for 7 days it prepared our meals, and other than being smaller than an actual stove (of course) I have nothing to complain about. I continue to use it now a couple of times per week when i do not want to heat the house up or when I am making something simple. 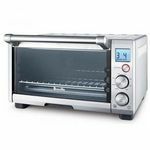 The toaster oven is easy to use and can prepare many different types of foods faster than what they would fix in the oven. 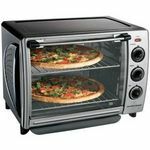 The toaster oven is big enough to hold 4 slices of bread or a small pizza so the options available to you are endless. There is a 30 minute timer on the toaster oven. This is a great feature because you will never forget foods again. And, thanks to the pull-out crumb tray the toaster oven is really easy to clean. 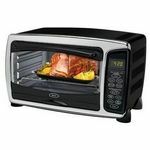 The foods prepared in this toaster oven taste great, they are easy to prepare and make life simple once again. The machine is affordable to most any budget also,so this is definitely a perk that any shopper can appreciate. Finally I like the size of this toaster oven. it is not too big, not too small, so you can make a variety of foods and easily store it on your counter with ease. I always have great results with this toaster oven. One of our favorite things to do is toast our bagels in it and it also works great for all those other little things that just need a small space to cook or heat up. Even Heating After I set the temperature on this toaster oven it keeps a good even temperature inside throughout the whole time I am cooking or toasting something in it. Safety The simple design help my kids to know where they can tough and where they cant so this is really a family friendly safe model. Ease of Cleaning The smooth surface of this toaster oven make it easy to wipe down and clean when needed. 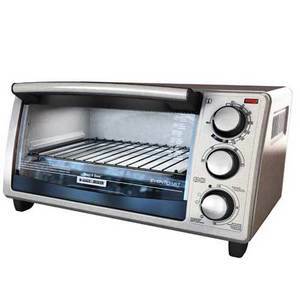 Durability This particular toaster oven model is very durable and strongly made and has been with us for a long time. Design I love the simple easy to understand design of this toaster oven model. The design is simple enough that even my kids can use it safely. All the buttons and settings are located conveniently. I bought this oven on sale and to my surprise it works great. Though, it could have been a little more spacious, for the price this is a nice little toaster oven. It seems to heat very evenly and is easy to use. 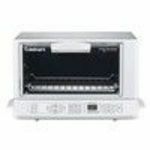 If you are looking for over the counter easy oven to work with, then this might be one. Nice, compact but perfect stuff. I love cooking with it and it is a great experience using it every time. Perhaps not for those who cook for a large family, it works well for a family of 2. I also bought one and gifted to my friend, she thanks me every time she uses it. If you are looking for a compact, over the counter, hassle-free, easy to clean oven, this might be one. Bake fresh cookies, pizza or whatever you can imagine doing in an oven. It won't let you down and you will be glad that you bought one. I have this oven for over a year now, no complains yet and I do not see any problem coming soon. Will recommend it to my friends, best buy for the price! I have been looking for a while for a toaster oven as an alternative way to cook. I don't like to turn the oven on for nuggets, or small things to cook and I don't like using a microwave unless I don't have any other options. So after much research we decided upon this toaster oven. We like the Blacks and Decker brand because they have been around for years and are trusted company. we felt the price of the toaster oven was very reasonable. It was smaller than we had expected. We were hoping for something a little bigger and will look for that with our next replacement purchase. The oven comes with a pan you can put items in, nuggets, corn dogs etc. You can also take it out and put the food directly on the grate as well. The oven has two different height settings. There is a light on the front of the oven that is red when the machine is on. There are also different tempeture setting for the toaster oven like there are for a full size oven. With this oven being on the smaller size it does not take up a lot of room on our counter. It fits perfectly in the corner. This cooks and toasts food great, we have had no complaints about that. The look of the toaster oven is very streamline and neat. The racks come out and this makes it easy to clean the bottom of the machine. Overall I would recommend this for someone looking for a small efficient toaster oven!